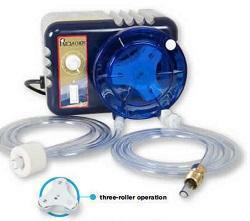 The Single Head Adjustable Output Pump is an ideal choice for treating problem water. Disinfection, pH control or adjustment, corrosion and scale control and oxidation are common water treatment applications found for this pump. The pumps are widely popular in the commercial pool industry for sanitizing swimming pool water or maintaining the equipment. Unique Stenner Features include interchangeable pump heads and tubes to convert one model to another without having to purchase a new pump. The easy and fast tube replacement without tools is made easy with the QuickPro® pump head. The pump is built with three detachable components; the motor, feed rate control and the pump head that can be separated without tools. 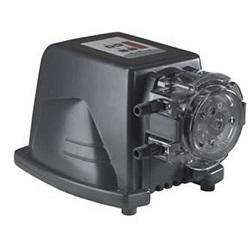 The Single Head Fixed Output Pump is Very similar to the adjustable rate pump but it has the fee rate control component removed. Ideal for situations where adjustment is not needed. Unique Stenner Features include interchangeable pump heads and tubes to convert one model to another without having to purchase a new pump. The easy and fast tube replacement without tools is made easy with the QuickPro® pump head. The pump is built with two detachable components; the motor and the pump head that can be separated without tools. 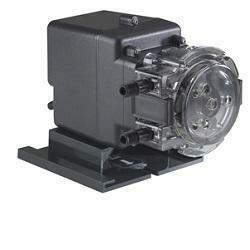 The SVP Series variable speed peristaltic injection pump is adjustable, has a DC motor and a detachable pump head. It features a rugged polycarbonate housing, heavy-duty gear motor and LED display with a four button control pad for easy operation. The SVP is categorized into two sub-series, SVP1 and SVP4. The SVP1 is manually adjusted using the keypad. The SVP4 is designed to respond directly to a 4-20mA input signal from water treatment controls including pH and ORP monitors to maintain proper water chemistry and treatment of effluent discharge water. The SVP4 is equipped with an external port to accept the signal or it can override the 4-20 mode to be manually adjusted with the arrows on the keypad. 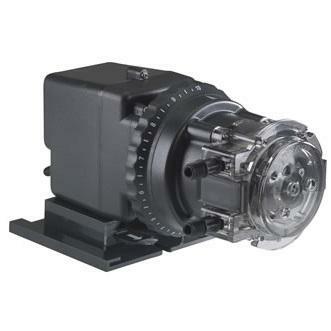 We have delt with numerous chemical feed pumps from lots of different manufactures. We can help you find part, or upgrade. We deal with Pulsatron, LMI, Blue & White, Stenner, DinoTec, Rolo-Chem and many other brands. Contact us to let us know how we can help.